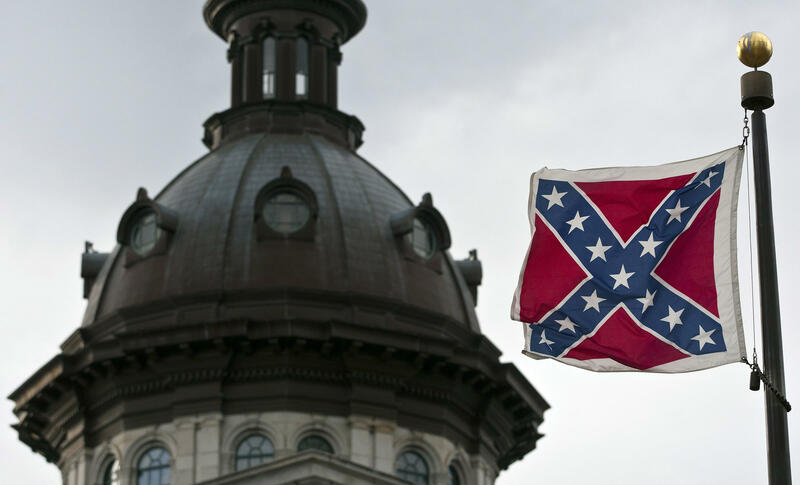 A Confederate flag flies outside the South Carolina State House in Columbia, South Carolina. A conservative South Carolina lawmaker lost his buddy last week. He watched as his state kept flying the Confederate flag high outside the statehouse, the same symbol that has inspired so many hate crimes in America. Norman Brannon had enough. He wishes his GOP colleagues running for president would step up and lead on this issue, too. But will they, or are they fearful of alienating the very small percentage of Americans who have a positive view of the South's pro-slavery banner during the 1861-65 Civil War? South Carolina leaders and some GOP candidates say the issue should wait until the funerals are completed for the nine people slain in a Charleston church on Wednesday. The suspect is a Confederate flag-loving racist whose writings indicate he was hoping to spark racial warfare. But there is no time to delay, says Mitt Romney, who on Saturday called the flag a "symbol of racism." Romney's position is in alignment with his 2012 opponent, President Barack Obama. On Friday, a White House spokesman said Obama believes the Confederate flag should be taken down and placed in a museum. The mayor of Charleston and a former governor of South Carolina have also called to take the flag down. The GOP's presidential wannabes have ducked the issue. Jeb Bush, the former Florida governor, tweeted that he moved the Confederate flag in 2001 from the state's Old Capitol "to a museum where it belonged.' But he did not explicitly call for the takedown, saying only that he was confident state leaders would, after a period of mourning, "do the right thing." Romney's GOP predecessor in 2008, John McCain, also has slammed South Carolina for allowing the flag to fly over its statehouse, a move that segregationist politicians engineered in 1962 to thumb their noses at the civil rights movement. McCain, a former P.O.W. whose courage is unquestioned on both sides of the aisle, criticized himself for political cowardice on the issue in 2000, muting his oppostion then to try to grab the votes of conservatives whites in that state's primary. Nonetheless, McCain lost that primary to George W. Bush, who, as Jake Tapper wrote then, "resorted to gay-baiting, Jew-baiting and race-baiting tactics against McCain.'' Those tactics worked in 2000. But is 2016 South Carolina the same place as 2000 South Carolina? Will Republican candidates have to knuckle under to knuckleheads to win one state's primary on a flag that engenders positive feelings in only about 9 percent of Americans? Are the stakes higher as Democrat Hillary Clinton can exploit the nation's revulsion at the flag in the days after its embrace by Dylan Roof, the self-declared racist who sought to inspire racial warfare with his massacre of nine African Americans inside a South Carolina church? Most of the GOP candidates have sought to stick to the old playbook: states rights, no outside agitators, etc. One 2016 GOP contender, Sen. Lindsay Graham of South Carolina, told CNN that removing the flag was worthy of debate, but added that the flag is "a part of who we are." Sen. Ted Cruz said in a statement that outsiders shouldn't dictate to South Carolina what to do with its flag. Ohio Gov. John Kasich said he was personally against the flag but it's ultimately "up to the people of South Carolina to decide.'' Former technology executive Carly Fiorina said she agrees the flag is a "symbol of racial hatred" yet told the AP her "personal opinion is not what's relevant here." The AP reported that Wisconsin Gov. Scott Walker ignored questions about the flag posed by reporters, as did spokesmen for Louisiana Gov. Bobby Jindal, former Arkansas Gov. Mike Huckabee, businessman Donald Trump and Sens. Rand Paul and Marco Rubio. The Washington Post's Philip Bump created this graph to show how South Carolina lawmakers could vote to ditch the flag.